This week Carter woke up with ear pain so we had a visit to the ENT and missed school for both boys. We went to a fair and had a delicious milkshake! Carter rocked a dentist appointment with X-rays even (Reid's behavior on the other hand...) and we're surviving some majorly rainy days. We're hoping the rain clears for some apple picking this weekend and I'm so excited to go to DC to see my college friends for brunch on Sunday! Now onto my five! This week finally feels like fall and for the first time in months I broke out some long sleeves and jeans! And the online orders are rolling in! I just cannot think about fall when it's in the 80's. I also broke down and bought some pumpkins! I usually wait until October for pumpkins but the minute my Hooray Everyday fall garland arrived I was inspired to decorate! I just got these jeans and I've worn them 2, ok 3 days in a row. Somehow during our move in May I lost a pair of my everyday jeans. And the only other jeans I have that fit are distressed. So I felt like I needed some non-holey jeans for the more mom-appropriate activities. They are so soft and comfy that I almost don't have to change into leggings when we get home (but I still do.) I ordered my usual size, but thought for a minute about exchanging for a smaller size. The waist is a little big for me but the legs fit (typical for me) so I just have to wear a belt. The good news is they haven't stretched- even after 3 days of wear! And they're $59. I'm not into selfies usually but I did post a selfie for #fallingforfallphotos on IG and a bunch of people commented on my shirt. It was a Nordstrom Anniversary sale find and was only $15. It's super soft and I love the fall color but when I took it off I noticed it's dry clean only. What?! If you are still interested it's Lush and you can find some colors on sale ($14) here and other colors here. I have a similar Caslon pocket tee that's cotton and machine washable that I like and found a few colors on sale ($8) this week so I ordered another one. I've been reading and researching a bunch of natural deodorants. My biggest worry about switching from my good old Secret is the rash that a lot of reviewers said they got. My hairdresser highly recommended Fresh. But seriously, $19 for deodorant!??! I'll be honest girls, I think I'm gonna try it. I love Fresh products and they smell so good and she said it works great. If you have other suggestions please share! I'll be back in a few weeks with a full review of my $19 deodorant. I went to Sephora to buy it and read the ingredients and it has aluminum in it so I talked to the sales girl and she recommended this instead. ($16) So I bought it. I'll be back with a review soon. 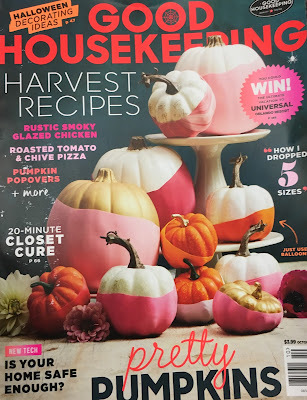 I went to a Pinterest pumpkin party last week and I was totally inspired by the Good Housekeeping cover. 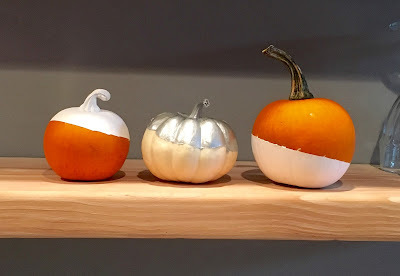 I had some similar ideas on my fall Pinterest board from years ago but couldn't believe that the pumpkins on the cover aren't painted, but instead they used balloons! Here's how my mini modern pumpkins turned out. Hope it's feeling like fall by you! A pinterest pumpkin party sounds fun! Ok I am loving the idea of a pumpkin party! I am soo curious how the balloon thing works? And I'm dying to know if a $19 deodorant is worth it! I'll be interested to hear how you like that deodorant! I've been wanting to switch too but have heard you don't get much coverage and can start to smell! How fun, going to a pumpkin pinterest party!! Thanks so much for sharing the info on the t-shirt! It's so cute! And I'm always looking for recommendations for jeans - I will definitely have to try those out! I love that garland! And those pumpkins on the cover are using balloons? That is so neat! I love how your pumpkins turned out! Have a great week!